What Sample Rate Do I Use To Measure Whole Body Vibration? 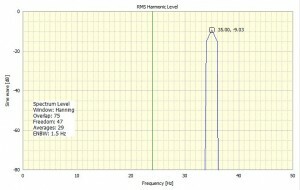 What sample rate should I use if I am measuring whole body vibration? Strict ISO8041 compliance imposes a minimum sample rate of 900 samples per second. This ensures the amplitude and phase characteristics of the applied weightings meet the required criteria. To take account of the anti alias hardware filter we would recommend 1200 samples/second. If non-strict compliance is used the minimum sample rate is 300 samples/second. ISO2631-1 recommends a minimum data duration of 227 seconds. However, for greater reliability, 600 seconds is now considered essential. That is, a 600 second or longer signal will be more representative and will provide better quality results. 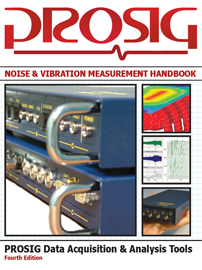 In the process of looking at some order data, a question about the accuracy of the measurement of the signal level of discrete frequency signals which were close to the general noise level. To answer this question, a small DATS worksheet was created which generated 2 signals. 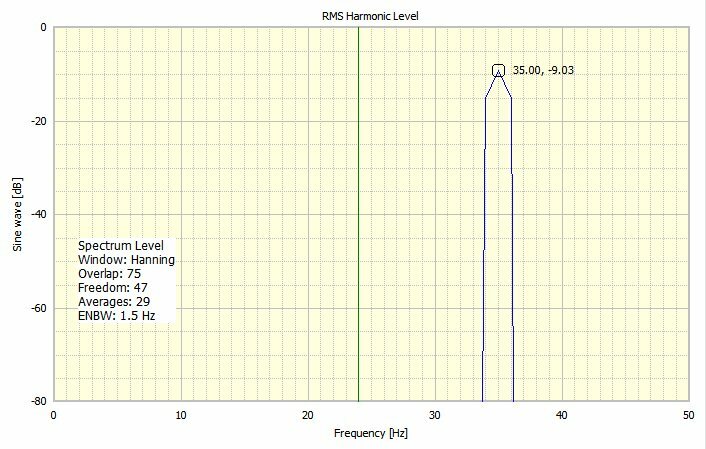 The first signal was a 35 Hz sinusoid which, by itself the spectrum level was measured to be approximately -9 dB (ref 1 V) as seen in Figure 1. What sensors are required to perform a Rotor Runout Measurement? A LVDT (Linear Variable Differential Transformer) probe. This is basically a contact probe. This will allow the measurement of the shaft total runout*. If an electrical runout measurement is also required then an additional eddy current probe (also known as a proximity probe) is needed. This is a non contact probe and can be used in conjunction with the LVDT to measure the electrical runout only. A once per revolution tachometer is also required. This could be optical, proximity, magnetic and so on. With these three sensors it is possible using the DATS Rotor Runout Measurement package to find both electrical and mechanical runout. * Total runout is a composite tolerance including the effects of cylindricity and concentricity, co-axiality, straightness and parallelism along the axis. A tutorial by James Wren (Prosig UK) on how to use the reference cursors in the DATS software to precisely measure features in your data. James Wren (Prosig UK) steps through how to calibrate a strain gauge for use with a Prosig P8000 system. A simple tutorial that explains how to use the DATS Acquisition software to set up a Prosig P8000 to capture data from a CAN-bus. How do I balance a shaft? “How do I balance a shaft?” seems like a fairly straightforward question, but there are a number of things that we need to understand first. Here we look at a number of key concepts that need to be understood in order perform balancing. Well broadly speaking to balance a shaft, mass must be added or removed at certain angles. The concept being that the centre of gravity and rotational centre of the shaft will be equal when the shaft is balanced. Continue reading How do I balance a shaft? The P8012, P8020 & P8048 can all be fitted with the 8440 CAN-bus/GPS card. Setting up the P8000 to capture CAN-bus data is extremely simple. In the following video, James Wren demonstrates how it is done.